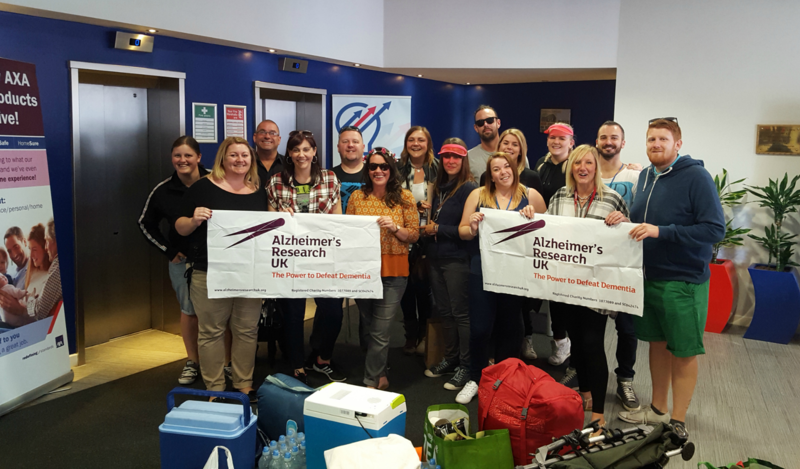 In 2015, over 50% of our employees voted for Alzheimer’s Research UK to become our new charity partnership. It’s clearly an issue that’s close to our hearts, and no wonder when 850,000 people are estimated to be living with dementia in the UK. So we’ve been doing everything we can to raise funds and support Alzheimer’s Research UK in their aim to bring about the first life-changing dementia treatment by 2025. We originally set ourselves a target of £250,000 by April 2018 and we’ve already smashed it. So we just wanted to say a huge thank you to everyone who’s baked a cake, jumped out of planes, cycled great distances, climbed the highest heights, walked, run and travelled far and wide to support our efforts. Here are just a few of the highlights of the journey so far. Ross Proctor took part in Race the Tide as part of a 12 person team. The challenge saw them complete a 100km endurance test, walking the coast of the Scottish/English border. Taking their fundraising to great heights, Ken Wright, his brother and two close friends set their sights on Mount Fuji. They successfully climbed 12,390ft up and back down again in just 24 hours and raised over £7,000. These are just a few of the amazing stories of dedication and support we’ve felt from our employees over the past two years. Our support also covers more than just raising much needed money. We’ve also been taking the time to share our professional expertise too, on a pro bono basis; from marketing advice to web development skills, we’ve been helping out wherever we can. And we’ve held regular talks and lab tours with Alzheimer’s Research UK, to keep everyone motivated and up-to-date with the progress being made in tackling dementia. It’s been an amazing two years and we aren’t finished yet. We’ve currently raised over £290,000 and we’re still going! Let’s see if we can reach £300,000.